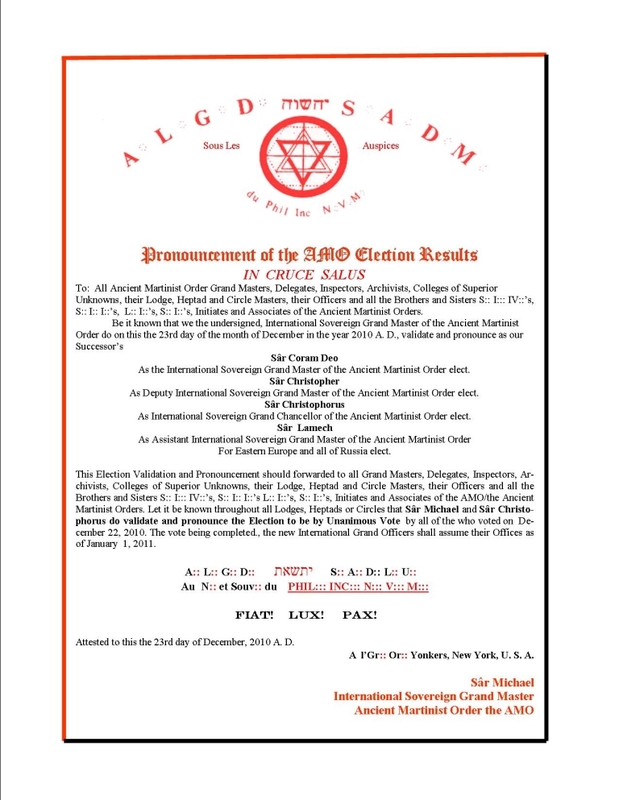 Sâr Coram Deo - As the International Sovereign Grand Master of the Ancient Martinist Order. For Eastern Europe and all of Russia. In April, 2012, Sâr Lamech resigned from the Ancient Martinist Order and formed a separate Martinist Order based in Russia. Hence, he no longer carries the title of Assistant International Sovereign Grand Master for Eastern Europe and all of Russia for the AMO, and does not speak for the Ancient Martinist Order in any capacity. The position of Grand Master for Russian and Eastern Europe is currently open, and these areas are directly administered by the International Sovereign Council. Sâr Coram Deo, Sâr Christopher, and Sâr Christophorus now form the International Sovereign Council of the Ancient Martinist Order, and are in charge of, and responsible for, all decisions concerning the direction and welfare of the Order throughout the world. Final authority on all matters of the Order rests in the hands of the International Sovereign Grand Master, Sâr Coram Deo.